Wash your hands to sanitize them. Then, take the eyeshadow of your choice. It has to be in powder form. Check the expiry date of the products before making the eyeliner. 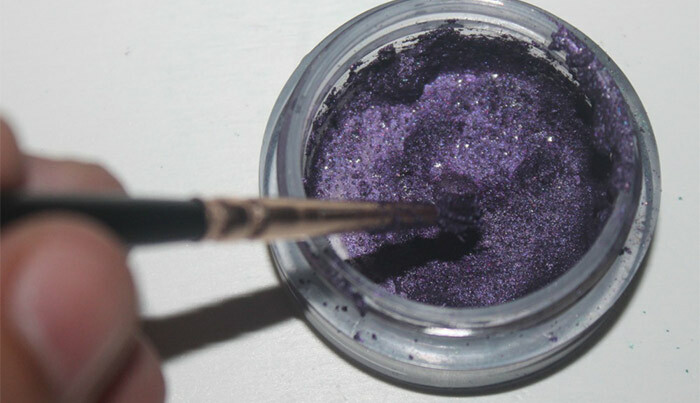 If you wish to make shimmery or satiny eyeliner, go for powder eye shadows, which contain shimmer or glitter particles. 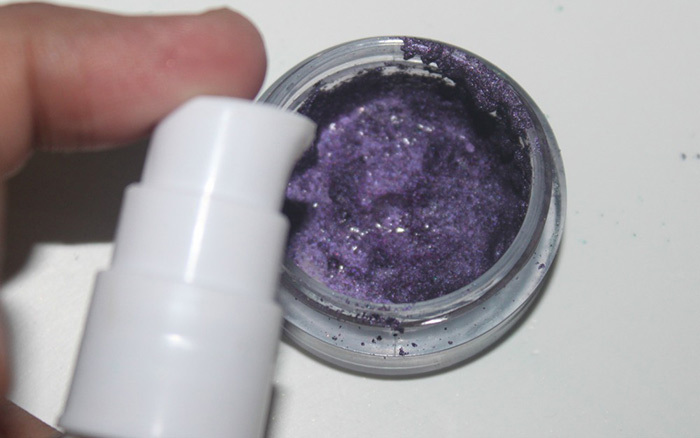 If you want a matte finish for your eyeliner, then go for powder eyeshadows in matte finish. You could also use a powder blush, highlight powder or any loose pigment for making this eyeliner. 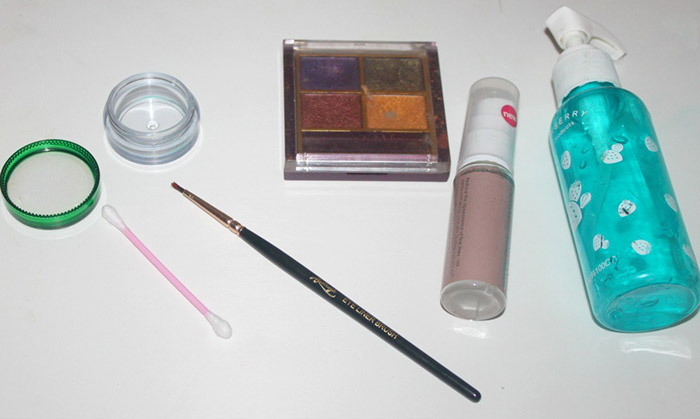 Here, I have used my favorite purple eyeshadow from the Lakme eye shadow palette in Tanjore Rush to make the eyeliner. 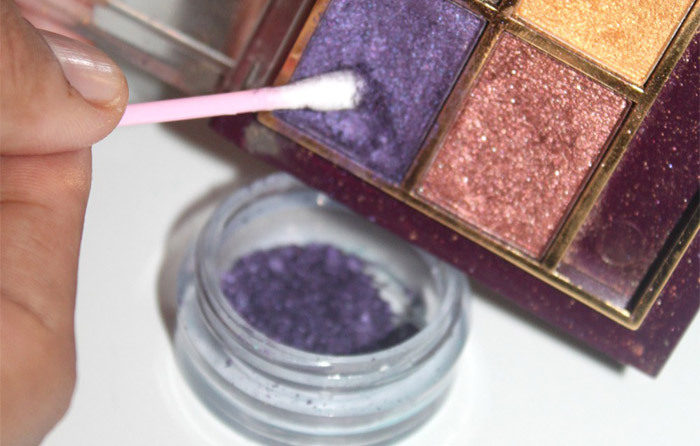 Start by scrapping the eye shadow gently with a clean cotton swab, and transfer the loose powder into a small container. As my eyeshadow was already broken, I just used a blunt knife to push it into the container. The container has to be clean and sanitized before use to avoid bacterial infections. It is simple to sanitize the container. Wash it with a detergent liquid soap or use a rubbing alcohol spray and wipe off the container. I used an old lip balm container to store my eye liner. 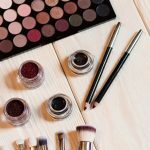 If you are trying to make the eyeliner for the first time, make sure you use only small amounts of the eyeshadow products to avoid any wastage. 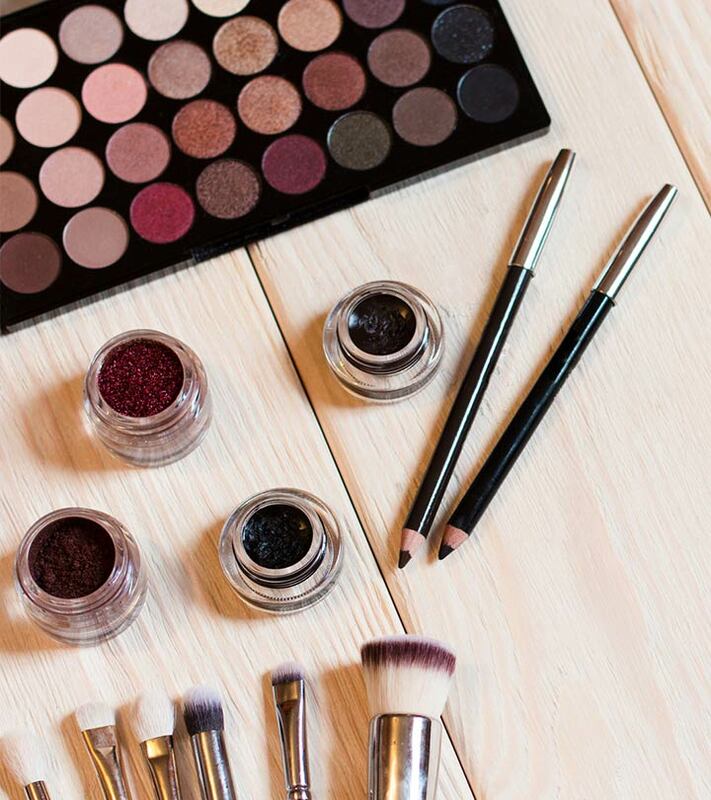 The amount of the eyeshadow to be taken for making the eyeliner depends on how much you would require. 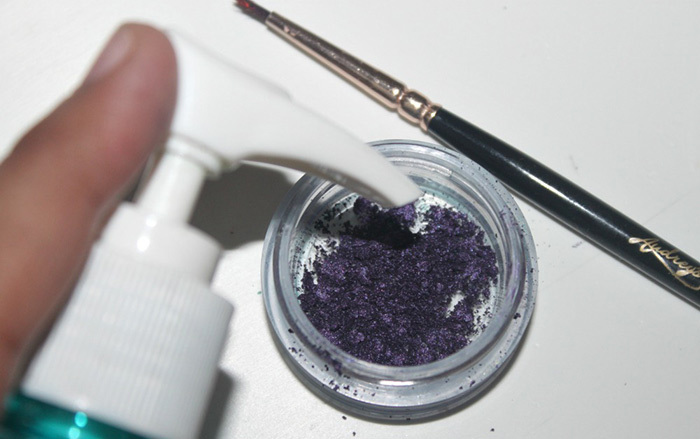 Now, add a few drops of water to the powder eye shadow for creating a liquid-like consistency. If you have refreshing eye drops, you can also use it instead of water to make the eyeliner. Use a pointed thin eyeliner brush and mix the powder well to form a thin liquid liner consistency. Start by adding few drops of water to avoid a runny consistency. Mix the powder eye shadow with the water for a good 2 minutes to avoid any lumps in the product, and check for fine consistency. Now, add a small amount of eye primer or a face primer to this mixture. This step is optional, but it is recommended as this will increase the longevity of the eyeliner. It will also avoid any creasing or budging of the product. 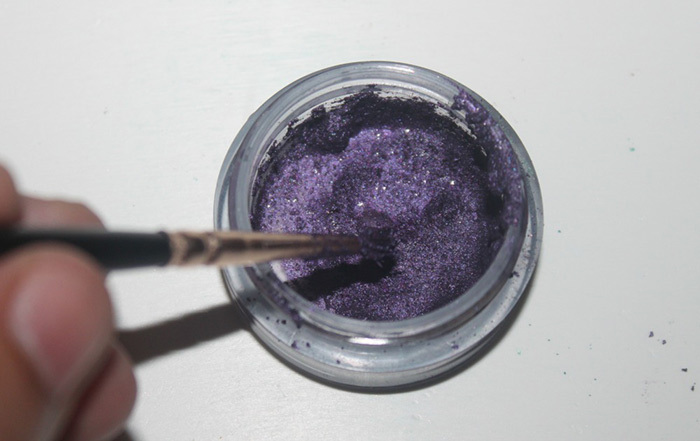 Mix the contents again for half a minute till the primer gets dissolved and mixed with the eyeliner completely. Close the cap of the container tightly, and store it. This eyeliner will last for a long time. This will also not dry or decrease in quality even after several days of storage. 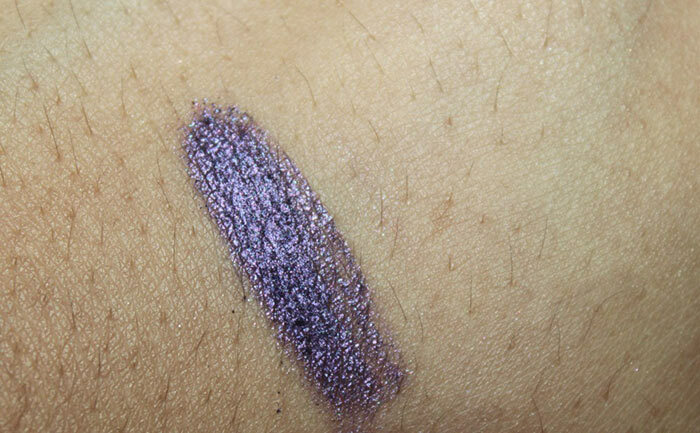 This eyeliner worked well and lasted for a good 4 hours on me as I had added the primer. The expiry of this eyeliner will be the same as the expiry of the eyeshadow. So, now you have created a brand new eyeliner without any cost. And you avoided wasting your old eyeshadow too! If you are on a budget, this trick is surely something you should try! And don’t forget to share your views with us in the comments section below.